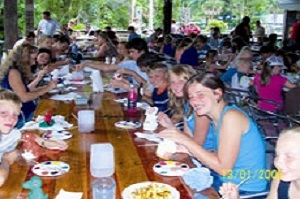 Peglegs is our "old world" themed function centre where many of our holiday activities take place. During the Sep/Oct and Christmas school holidays and the Easter break, our restaurant is open for brunch, lunch and dinner, serving a full range of hot and cold meals as well as snacks and takeaway food. 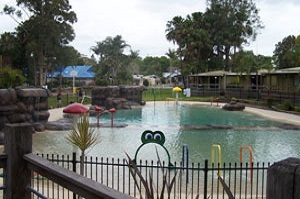 Naturally, Peglegs wouldn't be Peglegs, without the exclusive outdoor area that overlooks the new pool complex or the natural bush setting towards the river. All this and more can be enjoyed from the large outdoor deck area whilst your group watches the spectacular sun set through the towering palms. 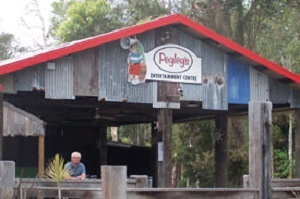 Our Peglegs area contains a fully equipped kitchen, bathroom facilities, has a beautiful view looking over the pools and can hold up to 250 people. Our friendly and helpful staff will assist you in planning a tailor made function to suit your needs. From hosting the party, providing entertainment and catering; Smugglers Cove is the perfect place for your next party! 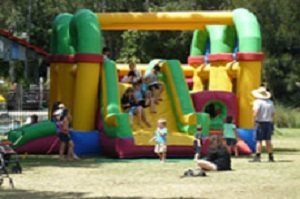 Our nautical themed holiday park is ideal for a relaxed family holiday. It's set on 20 acres of sub-tropical gardens beside scenic Pipers Bay in the heart of Forster on the NSW Mid North Coast.